Defective airbags made by Takata have killed 11 people in the U.S., and 16 people total, since 2009 because of faulty inflators that can eject metal shrapnel when the airbag is deployed. The serious risk of injury has resulted in the pervasive Takata airbag recall — which has so far claimed 28.5 million airbag inflators in 34 million cars, but could require recalls of as many as 85 million inflators. As of October 2016, 16 deaths and more than 100 injuries have been linked to Takata airbags, and over 60 million airbags contain a defect. 28 million airbags are recalled in the U.S. and the recall could potentially expand to even more manufacturers. Our firm is filing lawsuits on behalf of drivers of Honda and other cars who were harmed by shrapnel ejected when their Takata airbags were deployed. Many victims do not realize that their cuts and laceration injuries, which required the metal to be removed before getting stitches, were actually caused by Takata’s defective airbags, not their accident. If you or someone you know was involved in a car accident in which the airbags were deployed that caused such injuries, please contact us today for a free, no-risk consultation to see if you have a claim. Unfortunately, despite the ongoing recall and government regulators’ educational efforts, people continue to be killed or injured. Most recently, 50-year-old Delia Robles was killed by her Takata airbag after it deployed during a car accident, making her the 16th death and latest in the U.S.
May 2009: First death related to the airbags is announced. Oklahoma teenager Ashley Parham dies after airbag exploded inside her 2001 Honda Accord. Honda and Takata settle an undisclosed amount but deny fault. December 2009: Gurjit Rathore hits a mail truck in Richmond, Virginia, with her Honda Accord. Her airbag propelled shrapnel into her neck and chest, causing her to bleed to death. The family sues Honda and Takata in 2011 for $75 million, and in 2013 are awarded $3 million. July 27, 2014: Law Suk Leh, 43, from Malaysia dies from shrapnel shot out of the airbag inside her 2003 Honda City. This is the first fatality reported outside the United States. September 2014: Jewel Brangman, 26, dies from head and neck injuries inside a rented 2001 Honda Civic in the Los Angeles-area. The strong force of the airbag spewed metal shrapnel. October 2, 2014: Orlando woman Hien Thi Tran dies four days after an airbag shrapnel shot out inside her 2001 Accord. January 18, 2015: 35-year-old Carlos Solis is killed in Houston when the Takata airbag in his 2002 Honda Accord ruptures. April 5, 2015: Kylan Langlinais, 22, dies from laceration in Louisiana four days after she crashes her 2005 Civic into a utility pole. Honda only confirms her death two months later. July 22, 2015: An unidentified 13-year-old boy dies in the passenger seat of a 2001 Honda Accord in Mercer County, Pennsylvania. December 22, 2015: Georgia man Joel Knight, 52, dies on a South Carolina road after an accident inside his 2006 Ford Ranger. The metal shrapnel from his Takata airbag slices his neck. April 7, 2016: Hanif becomes the 10th victim in the United States, a few days after her 2002 Honda Civic rear-ends another vehicle and metal shrapnel from the exploding airbag strikes her neck. April 16, 2016: An unidentified person dies in Sabah State, Malaysia after an accident in which the airbag inflator ruptured in their 2006 Honda City. May 1, 2016: An unidentified person dies in Kedah State, Malaysia after the driver side air bag ruptures in their 2003 Honda City following an accident. June 25, 2016: Norazlin Haron, a 44-year old Malaysian woman dies when a projectile from the airbag strikes her in the chest after an accident involving her 2005 Honda City. September 24, 2016: An unidentified person dies in Johor State, Malaysia after an accident in which the driver-side airbag inflator ruptured in their 2009 Honda City. September 30, 2016: Delia Robles, a 50-year- old Corona, California resident dies at a hospital in Riverside, California after being injured by the airbag in her 2001 Honda Civic during an accident. If you were injured in an accident in which your airbag deployed, reach out to us. The attorneys at Morgan & Morgan are currently filing lawsuits on behalf of these victims. Some people injured by Takata’s airbags do not realize their injuries were caused by exploding shrapnel from the airbag, though. 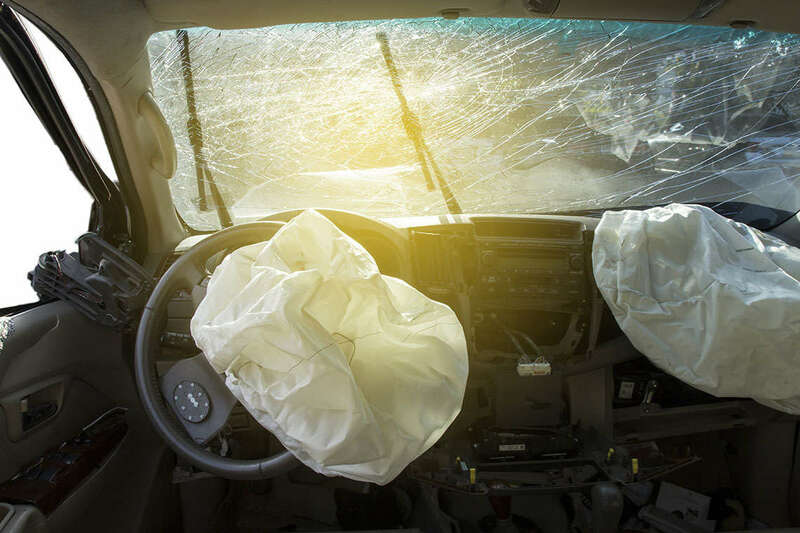 If you were in a car accident in which your airbag deployed and you sustained cuts or lacerations that needed stitches, the injuries you sustained may have been caused by shrapnel from the airbag, not the accident. Those injuries were preventable, and if you would like to hold the company allegedly responsible for your injuries accountable, fill out a free, no-obligation case evaluation form to find out if you are eligible to file a lawsuit.